Curcumin comes from the spice turmeric. Curcumin and hematuria are actually linked, as one can bring relief from symptoms caused by the other. Curcumin has been used for centuries in India, both as a spice and an herbal remedy, and it can help some hematuria sufferers depending on the cause of the condition. Curcumin is part of the spice turmeric, which is widely used in Indian foods such as curry dishes. 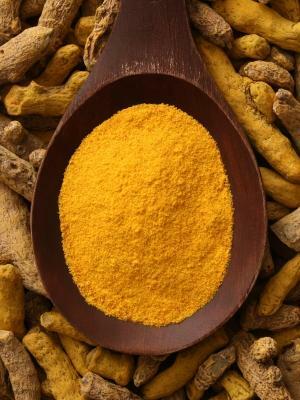 Curcumin lends the bright yellow color to the spice, and is also commonly found in yellow foods such as mustard, margarine, and even soft drinks as a natural dye. Found in the roots of the turmeric plant, curcumin is extracted when the roots are dried and crushed into a powder. The substance has plenty of medicinal qualities, and has long been used for its healing properties by the people of India, and naturopaths in the West. Hematuria occurs when red blood cells are found in the urine. Sometimes this blood is very obvious as bright red streaks or drops, but often it can go undetected until a doctor sees it under a microscope. On its own, hematuria can be a completely benign, recurring issue, or it can be a one-time problem caused by extreme exercise or repetitive motion, such as horseback riding. Sometimes, however, hematuria can be an indicator that there is an underlying health problem, such as kidney stones, problems with the bladder, or in men, a prostate issue. Causes for blood in the urine can range from a simple urinary tract infection to more serious diseases like cancer. Curcumin has many beneficial properties, and acts as an anti-inflammatory, antioxidant, and antiviral. It can relieve swelling, and also serves to reduce the formation of blood clots. In cases of hematuria where there is no serious underlying health condition causing blood to appear in the urine, curcumin has proven to be effective in relieving the symptoms. If the hematuria is being caused by a virus, curcumin can act as an antiviral agent to treat the virus itself. Many conditions can be reduced or even prevented with curcumin and hematuria is one of them. However, if there is a disease or other health problem causing the hematuria, curcumin alone will not eliminate the causes. It's always best to see your doctor and ask for advice before trying to treat a health issue alone. One of the appealing aspects of curcumin is that it's a natural product. Even when used as a spice in foods, the health benefits and healing properties are present. With testing and research still ongoing, it may be discovered that curcumin can help with many more health problems as well. Curcumin can be eaten, as turmeric, daily with no side effects except the possibility of diarrhea or mild stomach upset. The spice itself is quite hot, so if you aren't used to spicy foods, your body may react to the sudden intake. If you're not a fan of the hot spices, however, curcumin is available as a supplement. The powder is placed in caplets, and taken orally. The same possibility of diarrhea or upset stomach exists even when using supplements, however. If you're a vegetarian or vegan, however, check to make sure that the capsules themselves do not contain gelatin or other animal products. These supplements can be found wherever you purchase health food or other nutritional supplements. The general recommendation is to take two or three daily, spaced out and taken with food. Read the directions on the supplements, or ask your doctor about how much you should be taking.